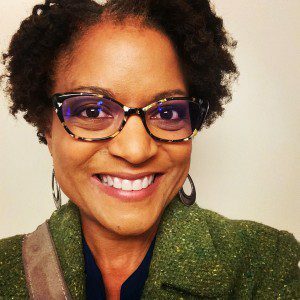 It’s my great pleasure to welcome the one and only Deidra Riggs to the blog this week! 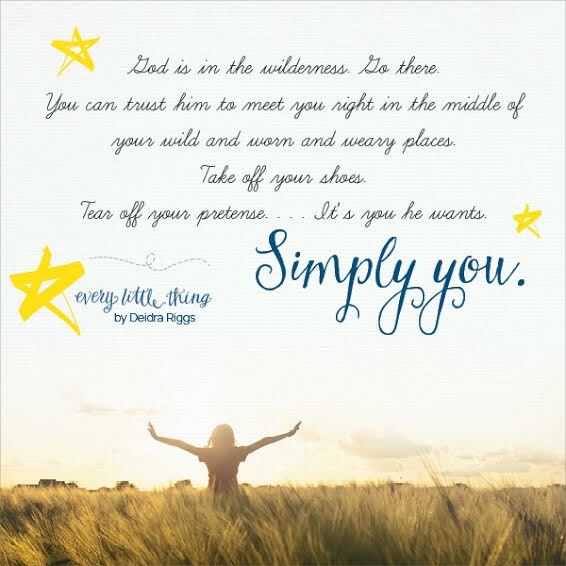 Deidra is the author of Every Little Thing: Making a World of Difference Right Where You Are. Today’s post is a special message from Deidra to you; tomorrow, I’ll post my own review of her book, as well as feature an exclusive video interview and a giveaway! For today’s post, I asked Deidra the question below. Enjoy her words that follow, then go get yourself a copy of her book! 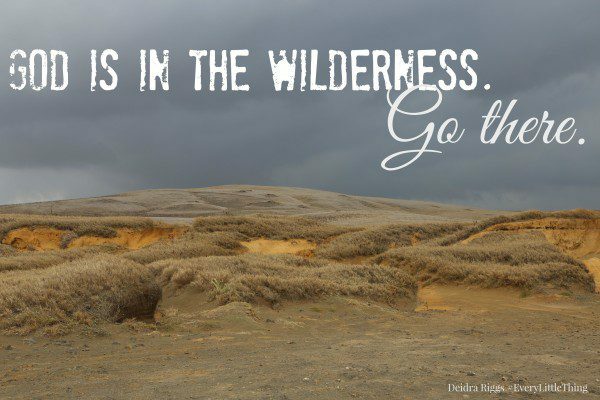 What words of encouragement can you give to the woman who finds herself in the middle of a wilderness right now? Let me say this gently, to be sure we’re on the same page, here. I have been guilty of believing God thinks like me. I have been convinced God sees the world through the very same glasses I carry around with me in the pocket of my favorite dress. I have been mistaken, you see. I’ve completely misunderstood the things of God, especially when it comes to the wilderness. And, I’m not saying I’ve got God figured out, because that would just be silly. But I have learned a thing or two about the wilderness. Mostly, I’ve learned the wilderness is nothing I would wish on anyone. And, more than that, I know beyond the shadow of a doubt that I wouldn’t trade my wilderness experiences for anything. Not anything. If you’ve spent any time in the wilderness — whether the literal wilderness, or a figurative version — you can probably vouch for the fact that the wilderness seems an uncultivated place. In other words, the wilderness is a place unfit for planting seeds or harvesting crops. The brush and brambles grow up and take over and no good thing can take root there. The wilderness is where things go to die, and nothing could be worse than death. Except, of course, resurrection and new life. If you’re standing at the edge of a wilderness season in your life, your future seems cold and dark and lonely and scary. You may be hanging on with all your might, resisting a lonely trek into the cavern of hopelessness. You stand at the threshold of your own personal wilderness and when you whisper or yell into the darkness, there is no response. Not even the empty echo of your voice. You are convinced God will never find you if that darkness overtakes you. But, sister, you would be wrong. If you are in the middle of the inhospitable wilderness, you may long for someone who will bring you a cool drink of water, or a gentle touch of comfort. You may have lost all hope. You may be one breath away from throwing in the towel. There is no welcome in the wilderness— no respite from the storm. Or so it seems. In the sixteenth chapter of Exodus, the people of God have come through the Red Sea because God caused the waters to separate. He carved a pathway through the water and the entire nation of Israel walked through the sea without getting their feet wet. Now, on the other side of the sea, with Pharoah’s army miraculously defeated, the children of God are hungry. They complain, quite loudly. They tell Moses they’d like to go back to Egypt and be slaves again, because at least that was better than being free in the desert without any food to eat. Don’t rush past those words, because they hold the treasure and the promise for us of a God of “through.” Just as God led the children of Israel through the Red Sea, God also leads us through the wilderness. In a strangely beautiful and holy turn of events, the wilderness is God’s intimate invitation to us. He is there in the wilderness, before we arrive. He is with us in the darkness and through the aching watches of the night. He is pruning off and casting aside the fruitless branches of our character that weigh us down and poison the soil of our hearts. The wilderness may indeed be dark and lonely, uncultivated and unwelcoming. But it is not an isolation chamber. Nor is it a destination. God is there with us, delivering us through. He specializes in resurrection and new life. He delivers us from evil. He has promised he will never leave us, and never forsake us. He leads us through — even through the valley of the shadow of death. Nothing is lost in God’s economy, and he redeems the wilderness seasons, because it is his nature. He can’t help it. God’s invitation to the wilderness is a sacred call. He extends his hand to you, and he promises to bring you (not send you) through. You can trust him. He is with you in the pain and the tears and the fear and worry. He is in the wilderness, with all of its winnowing and breaking and reshaping and remolding. Cling to his heartbeat. Find shelter beneath his wings. Weeping endures for a night, but there is joy promised to us. There is hope. God will bring you through. 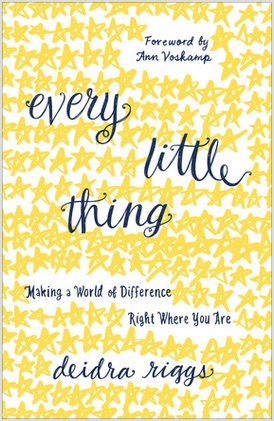 Deidra Riggs is the author of Every Little Thing: Making a World of Difference Right Where You Are (Baker Books). She is managing editor at The High Calling, and a monthly contributor to (in)courage. Deidra and her husband live in Lincoln, Nebraska. They are the proud parents of two adult children, and happy inhabitants of an empty nest. Follow Deidra on her blog, and on Facebook, Twitter, and Instagram. Don’t forget to come back tomorrow for my review of Every Little Thing, plus a video interview with Deidra, AND a giveaway!! Thank you so much for hosting me here today. It’s been such a gift to get to know you, and to learn about your journey, your ministry, and your heart. I’m grateful to share these trips around the sun with you. Richest blessings in all things and in every little thing.